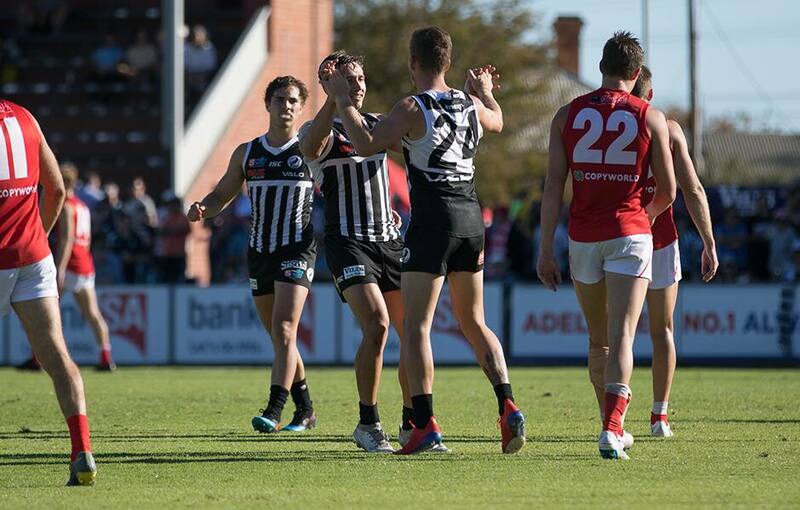 PORT ADELAIDE flexed its muscles in a dominant display to beat reigning premiers North Adelaide by 21 points at Alberton Oval on Sunday. The Magpies tackled furiously, carried the ball and forced the Roosters to make mistakes in a clinical 16.11-107 to 13.8-86 victory. It was a fiery first quarter as Mitchell Mead and Jack Trengove both fell victim to heavy hits before Port Adelaide had the better of the opening 15 minutes. The Magpies kicked three of the first four goals through Matthew Broadbent, Todd Marshall and Aidyn Johnson in an electric start before both defences controlled the middle portion of the term. North Adelaide came into quarter time with a flurry, snapping an 11-minute scoreless period to pile on three goals in four minutes. The lead spanned out to 13 points before Tobin Cox converted a set shot after the quarter time siren for the Magpies to reduce the margin to seven points at the first break. The game’s intensity lifted again in the second quarter as Port kicked five goals to North’s two to take an 11-point lead and all the momentum into the main break. Jarrod Lienert found plenty of the ball and finished the half with 19 disposals as he and Broadbent played vital roles across half back, both having a hand propelling opposition attacks into coast to coast goals for the Magpies. Port Adelaide were quicker and harder at the ball in an entertaining second quarter which was epitomised by Sam Davidson. Davidson went on a 100m sprint to receive a handball and goal in the goal square, before putting his body on the line to intercept a Roosters rebound 50 and set up Kane Farrell’s first goal. Full of run, carry and an intent to take the game on at all costs, Port started the third quarter in the same fashion it finished the second as Farrell burst the 50m ark to goal in the first 19 seconds. Marshall was a commanding force for the Magpies - he booted his fourth goal at the six-minute mark of the third term as Port began to control the contest and the scoreboard, taking the lead past four goals. Port kicked its sixth consecutive goal when Lienert found space inside 50 before North’s Alex Barns goaled from 50m against the flow. Port answered straight back through Ladhams, but a 25m penalty and goal to Rooster Jarred Allmond on the three quarter time siren gave the Roosters some hope. Leading by 33 points going into the final quarter, proceedings got off to the best possible start for North with Mitch Harvey curling one home from the grandstand pocket in the opening two minutes. Ben Edwards got things back on track with an instant reply, as Port began to hold onto the ball and take ownership of the game. Late last quarter goals to Tom Schwarz, Keegan Ramsey and former Port forward Jake Neade reduced the margin to 21 points but the Roosters ran out of time as the Magpies picked up their second win of 2019. With major statistics fairly even at half time, Port Adelaide dominated the disposals and inside 50s in the second half, while remaining even in the tackle count. Marshall finished with four goals, while Cox, Farrell and Peter Ladhams each kicked two. Jack Trengove continued his stellar start to the season with 35 disposals, while Lienert and Sam Mayes each collected 33 disposals.